Willy’s Stories is the latest of Anthony Browne’s stories featuring the wonderful Willy, a curious and adventurous young gorilla. In this book, every time Willy steps through a particular set of doors, he starts a new adventure. Amongst them, Willy is shipwrecked, caught in a tornado, and even falls down a rabbit hole. If those situations sound somewhat familiar, you’d be right. 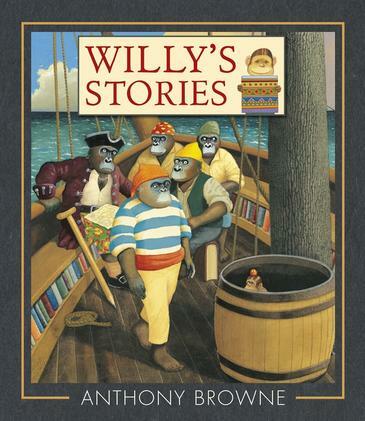 Willy’s amazing adventures have much in common with fairy tales and classic stories like Robinson Crusoe, The Wind in the Willows, and Rapunzel. Willy tells you a bit about a new adventure each time you turn the page, with a focus on a key scene, and ending with a question about what you think might happen next, or what you would do in the same situation. They all come with a new illustration in the recognisable style of Anthony Browne, who was Britain's Children’s Laureate from 2009-2011. The secret to Willy’s adventures is revealed at the end of the story, and I don’t think it spoils anything to say that Willy goes on his adventures by reading books. See how many of them you’re able to guess before you reach the conclusion. Willy’s Stories is a clever tribute to storytelling and encouraging use of your imagination.